The Shed is located to the rear of Belair Uniting Church. On Wednesday mornings from 9.30am to 12noon, a group of retired blokes get together and enjoy each other’s company, fellowship and to do something for the community. Projects so far have included renovating furniture for refugees, refurbishing wheelchairs and walking frames, and renovating bikes for the needy. 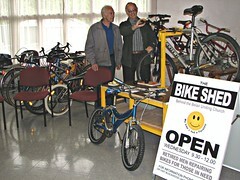 Primary activities including providing safe and roadworthy bikes to disadvantaged people, including refugees, but also to the local public. 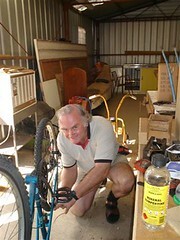 The blokes at The Shed also recycle any old and discarded bikes to help raise funds to purchase materials needed to repair bikes. In the past, The Shed have run workshops at local primary schools, showing students how to maintain, adjust and care for their bikes to get maximum safety and reliability from them. They have also sent bicycles to the APY lands, preparing them specifically for the harsh conditions and unsealed roads up there. They hope this will become more regular in the near future. All blokes are welcome at The Shed, as are any donations of old or unwanted “wheeled” items, and financial assistance to help keep The Shed doing great work. The blokes also love a good cuppa and cake too! Click HERE to go back to the Blackwood Community Classes page.